Democratic congressional candidate Alexandria Ocasio-Cortez backed off her support for a two-state solution to the Israeli-Palestinian conflict only three days after first voicing it. The upstart New York politician and self-described democratic socialist has a history of being critical of Israel, tweeting during her campaign that the killing of Palestinians at mass border protests by Israeli security forces was "a massacre." But during a Friday interview on PBS' "Firing Line" Friday, Ocasio-Cortez gave a more nuanced answer when asked her views on the Jewish state. "Well, I believe absolutely in Israel’s right to exist. I am a proponent of a two-state solution. And for me, it’s not — this is not a referendum on the state of Israel," she said. Ocasio-Cortez walked back her use of the terms "massacre" and "occupation." "I am not the expert on geopolitics on this issue," she laughed. "I am a firm believer in finding a two-state solution on this issue, and I'm happy to sit down with leaders on both of these…"
But when Ocasio-Cortez interviewed with the left-wing Democracy Now! on Monday, she was singing a different tune, now declining to say she supported the two-state solution. "Are you still for a two-state solution with Israel and Palestine?" asked host Amy Goodman. "You know, I think this is a conversation that I'm engaging with with activists right now," she responded. "Because this is a huge– especially over this weekend. This is a conversation that I'm sitting down with lots of activists in this movement on, and I'm looking forward to engaging in this conversation." 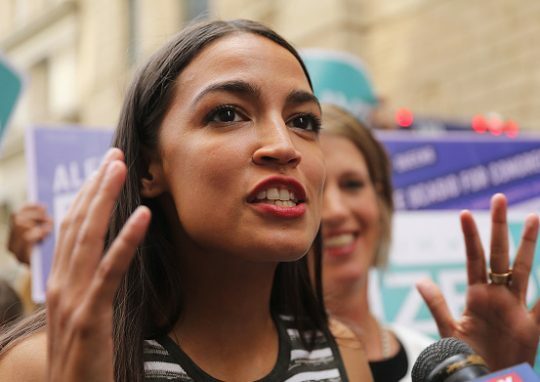 Ocasio-Cortez became the Democratic congressional nominee in New York's 14th Congressional District after defeating incumbent Rep. Joe Crowley in last month's primary. This entry was posted in Politics and tagged Alexandria Ocasio-Cortez, Democratic Party, Israel. Bookmark the permalink.